Thanks to mobile communications and other technologies, telework is becoming increasingly popular. One group of people is taking full advantage of being able to work from just about anywhere: digital nomads. Hotel rooms become their second home and cars their mobile office. Since they spend a lot of time travelling by car (or plane! ), they need to remain efficient and still crave some of the comforts of home. To make nomadic life a little easier and more enjoyable, we have curated a few helpful items for the car. Long trips sometime require a little pick-me-up. With the portable Handcoffee Auto by Handpresso, which plugs into your car’s 12 V (cigarette lighter) socket, enjoy an espresso on the go. With wireless AirPods, which work with all Apple devices and shut off the moment you take them out, ask Siri for directions without taking your hands off the wheel. BMW’s Travel and Comfort Clothes Hanger, which attaches between the supports of your headrest, will ensure that you are dressed to impress at your next business meeting. 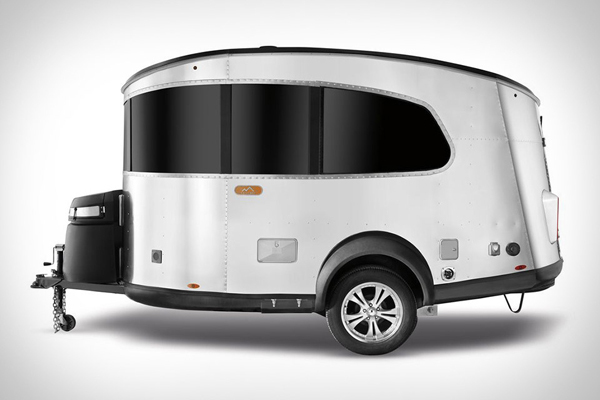 Finally, if you’re getting sick of hotels, why not hitch a travel trailer to your vehicle? With its panoramic windows, popular brand Airstream’s Basecamp model gives you a room with a fantastic view.